I still have a vivid memory from 3 years ago during Planting Peace (another MCC Alberta young adult program) when our friend Maggie wept as she asked us whether we knew what Canadian mines were doing to her country of Guatemala. I was shocked as she described how a Canadian mine has caused incredible devastation – both environmental and social – to her community. Maggie’s face was in my mind all day as we travelled through the Guatemala highlands to San Miguel, where Marlin mine operates, a subsidiary of the Canadian company Goldcorp. We first met with a number of community organizers in San Miguel at a Catholic Church where they are resisting the mine. They took the time to tell us how the mine has affected their community, a tale of destruction consistent with what Maggie had told us in Canada. It was an honor to hear the stories of these strong women and men willing to speak out against the mine. They spoke of the visible environmental signs of destruction caused by the mine: their river is now polluted, animals and humans are becoming sick, and they have to buy water from other municipalities because the mine used up their natural spring (it was said that the water the mine uses in 1 hour is equivalent to what 1 family in the community would use for 25 years). Apparently a couple of boys in the community now have a skin condition and difficulty walking, all because they played in the river by their school, which also happens to be where the toxic chemicals used to separate out the gold get dumped. They also spoke of the social implications for the community: almost all of the people who lived by the mine have been forced to move elsewhere, bars and prostitution have sprung up, and there is great division in the community between those who support the mine and those who speak out against it. We heard how the mine promotes all the positive ‘development’ they are bringing to the community and how people originally allowed the mine to enter under coerision and promises of many good things that haven’t been followed through on. 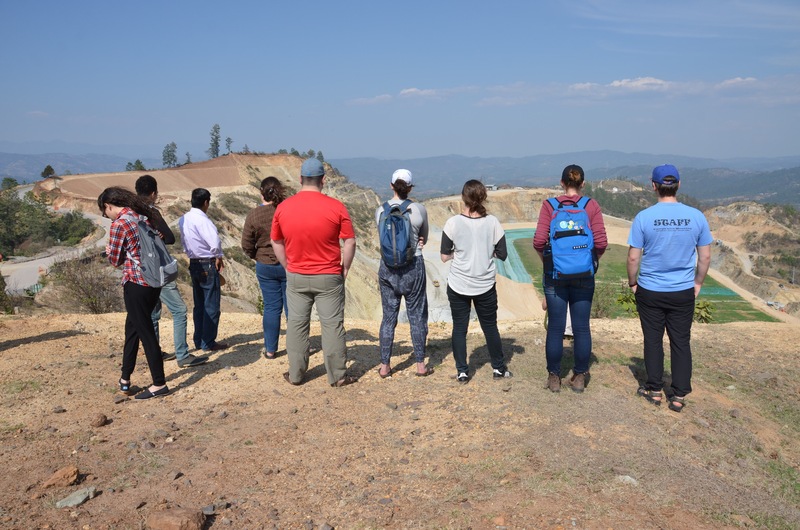 We heard how the mine employs some community members (for lower wages than originally promised) while deemploying many more people through pollution. The advocates spoke of the difficulties of speaking out against the mine including being resisted by mine workers, receiving threats, and powerful people striving to silence them. They voiced the deep complexity that the environmental damage has already been done and if they succeed in getting the mine to leave, what next?… for they will simply move on to a new community to destroy. A spot where houses once stood. They have spent years now filling the hole in. Naturally it was hard to sit and hear the incredible hardship that the mine, the ‘capitalist monster’, has inflicted on the community. Yet there was also incredible resilience and beauty in the community organizer’s words. Again and again they came back to the concept of returning to the earth and the importance of reconnecting to the sacredness of the mountains, the earth, and the water. They voiced a deep recognition of the value for the earth, their need for healthy land, and the importance of stewarding what we have been given for the next generation. This was a hope founded in a weaving together of spiritually, Indigenous values, and the teachings of the church. We also heard beautiful stories about how women are finding their voice and are central to the resistance. It was incredible to hear about the group’s perseverance in raising consciousness, striving to hold the mine accountable, and seeking to build peace in their community despite differences of opinions. When I asked what stories they would like us to share with our communities back home in Canada, we were asked to share the story of how the mine has ended our livelihoods and caused so many problems – ‘is it just that they can just come and do this to our land?’. They spoke of how the mine is slowly killing their community, especially due to the deeply polluted water. They asked us to raise awareness, for this is happening in many other countries and will continue to happen else where. After lunch we drove to a couple spots overlooking the mine while Elsa and Edwin explained more about what was happening there. We saw a place that used to be filled with houses, but now is a deep open pit mine. It was startling to see a huge ‘pond’ filled with toxic sludge, which is slowly being turned to cement while excess is piped into the river. 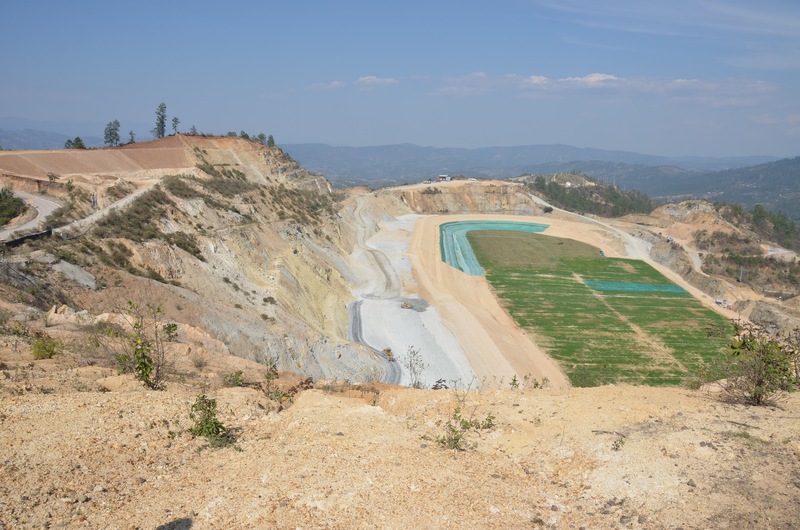 We heard of the efforts being made to refill the open pit and plant trees, efforts which our local guides were highly skeptical of, knowing it would be used to make the mine look good but the amount of chemicals in the land will make it impossible to use the land any time soon. As we stood overlooking the mine, the message we had heard earlier in the day from Father Eric rang in my ears: how can we have peace in the world without stopping the desire for more? He had spoke of how the North’s consumerism drives demand and leads to this destruction. How we need to learn to live with less and stop living in excess so that we can all continue to live. 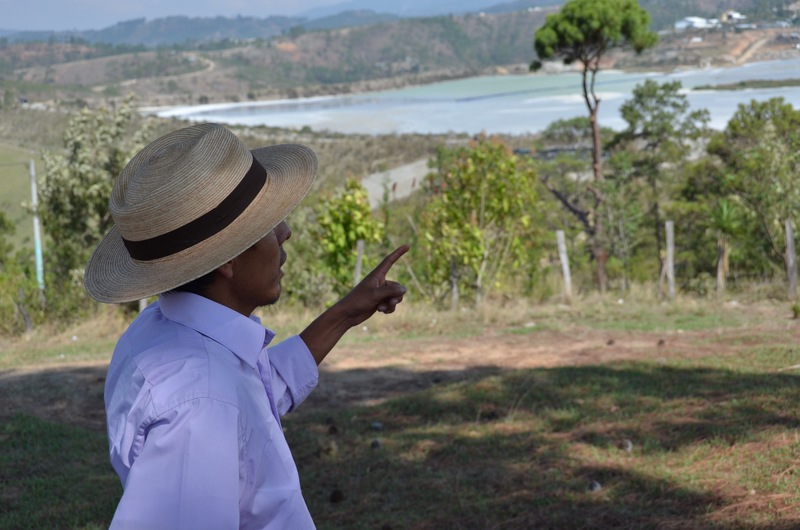 Standing in rural Guatemala, I find myself implicated in this story… how do I stand there knowing my own consumerism and greed plays a part in destroying this once beautiful mountain? At this point I have no good ideas of what to do next and no idea of how this experience of seeing the mine might change how I live. For now, I think that is okay – it is a complex problem I am only beginning to understand, so I won’t grasp for solutions quite yet. I will sit and lament for this deeply broken world, this grieving community of San Miguel, these mountains and rivers destroyed. 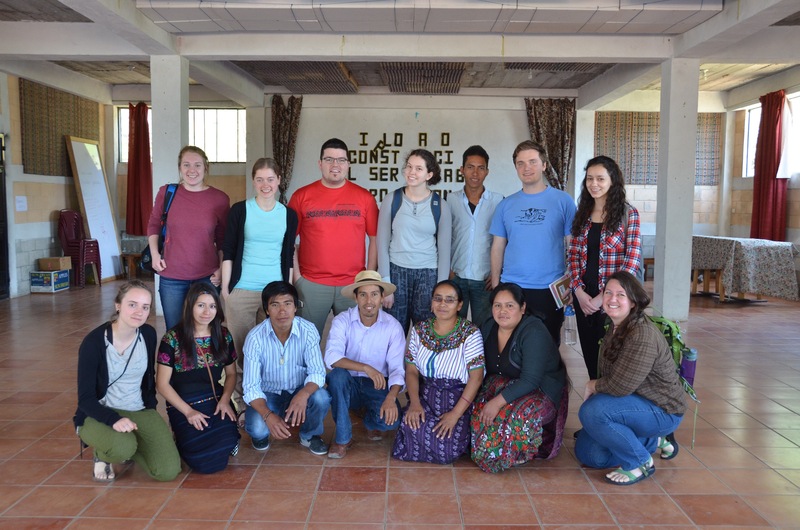 I will sit in the beauty and discomfort of knowing that we are all deeply connected – in the best and worst ways – and my story is interwoven with the story of these people we have met in Guatemala. I will also sit in hope, having glimpsed the strength of these people. I gratefully accept the reminder that we all need to find ways to return to the earth, honor the sacredness of the mountains, and recognize how deeply connected we are to the land.